Using your hands, mix graham cracker crumbs, brown sugar, and melted butter together. Press graham mixture into a 5-inch springform pan. Make sure to press crumbs against the edges creating a crust all around. Place graham filled springform pan in the freezer while you work on the batter. In a mixer, add in cream cheese and lemon juice. Beat on high until creamy and well combined. Pour in whipping cream and continue to beat until batter becomes thick. Sprinkle sugar in and beat on high until batter becomes stiff and thick. Spoon batter into the center of the prepared springform pan and place in fridge overnight or for a minimum of 4 hours. You can top with any other fresh fruits. Graham crumbs can be substituted with chocolate cookie crumbs for a different taste. I think that most of us can agree that cheesecake is wonderful. It has been around making all of our palates a happy place for many years now. 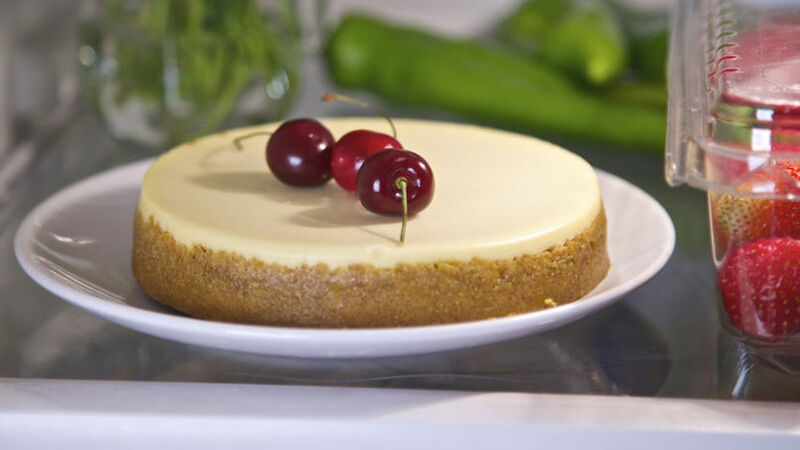 I especially love refrigerated cheesecake during these hot summer months. I also like it because it's really easy to make. There are a lot of flavors to choose from, too: some of the more common ones include passion fruit, chocolate, raspberry, lemon, caramel, and vanilla. Mmm… right!? Every year around this time I start thinking about which one I'm going to prepare to kick off the summer. I like to constantly have one in the freezer throughout this sweltering season so I can get in a forkful whenever I get overheated. It helps me to cool off–at least that's what I'm telling myself! I find myself getting a forkful to cool off about 5 times a day! But it isn't just me getting tempted by this chilled tasting dessert. The boys in my family are steadily picking at it all day long as well. Yeah, we are cheesecake heads around here and refrigerated cheesecake will make you one too this summer. Give it a go and chill out!